The Japanese government plans to begin disassembling parts of the Fukushima-Daiichi power plant next year, beginning with the removal of some 566 fuel rods from the crippled number 3 reactor. But rather than send human technicians into the radiation-soaked reactor (and certain death), Toshiba unveiled on Monday a remote controlled robot that will do it for us. The robot is designed to sit on the surface of the cooling pool where it will use a pair of manipulators to pick up debris from the water while a third arm chops them into more manageable pieces. Once all the debris have been cleared, the robot will then remove the rods from their assemblies. By doing so, Toshiba engineers figure that the amount of radiation in reactor 3, should begin to approach 1 millisievert per hour -- still too high for humans to endure for long-periods of time but at least better than it is now. 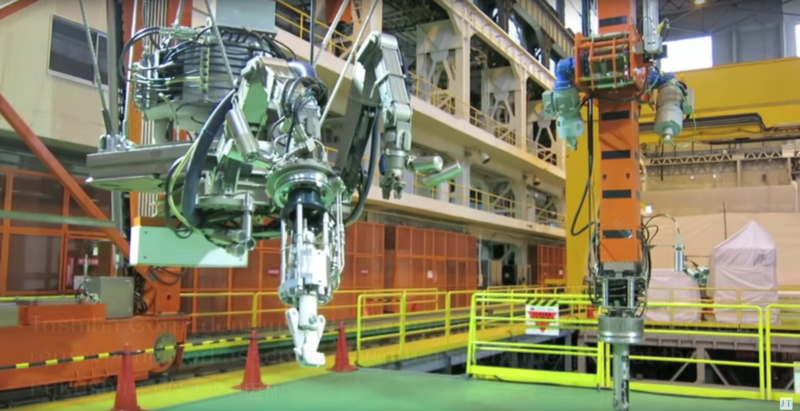 This isn't the first robot Toshiba has built specifically to help clean up the aftermath of the Fukushima meltdown. The company debuted a mechanized quadruped in 2012 designed to act as a forward scout for the repair efforts. In fact, the Fukushima disaster has spawned a number of exotic technological solutions -- from ice walls to block the plant's irradiated water to subatomic particle maps of the busted reactor core. Let's just hope they don't have to resort to Coppelion.